Flavor grenade to the right, flavor queen behind, dapple dandy to the left, and splash is leafed out. Thank you for that info sheet. I’m developing a Frost Prediction app iphone users and I would like to integrate temp ranges like these for future iterations. Could you explain what Old temp means? I’m assuming that 10 and 90% is referring to the liklihood of killing off whatever is growing. Everything except for a couple peach trees are leafed out and blooming…Citrus got started early this year, seems like I barely picked the last fruit from my grapefruit tree before it started budding. I got my wife to come walk with me through the orchard to check out the new blossoms. It looks like I have some fruit buds on my Moonglow and Orient pear. All three of my pluots have little green leaves, although they’re tiny. And all four of the peaches have very small leaf buds and it looks like some fruit buds. Most of the apples are still quiet except my Alkmene tree is showing a few small fruit buds. Somerset, KY…Bradford pears full bloom in town. My Granny Smith has green tips…and Kizil Alma 826 has half inch leaves…amazing what 5 days of warm weather will do. After 12 degrees a week and a half ago. And my rootstocks shipped Monday did not show up today. But my JW Jung order arrived. I didn’t notice any obvious fruit buds earlier in the week, but yeah, this warm weather gave them a boost. But after today, it’s going to drop back down to the 50s/30s. I thought you ordered your rootstocks from Cummins? You’d think they would have arrived already from NY. I’ve ordered from them twice and always got them on a Wed or Thu (they ship out on Mon). I only have one tree on 890, but I’d be interested in how they do. Have your G30 trees grown a lot? My three sure have. No, I had roots shipped last Monday from Burnt Ridge in Washington State. And Cummins will ship my other ones on Monday. *On 50 rootstocks, I saved $50 by NOT ordering the non-Geneva roots from Cummins. My red fleshed Redlove Odysso apples arrived from Wisconsin. I have plenty of scions in the 'fridge…but it’s too late to collect most here now. Sap;s up, bark grafts will work. In the past there was conventional wisdom that generically stated that damage to blossoms was likely to occur at a certain temp for each type of fruit tree. This is referred to as the “Old Temp.” It was probably an educated guess that erred on the side of caution. They’ve since ran more tests and came up with some better educated guesses. They’ve also given a range showing when a little damage happens and when a lot of damage happens. 10% represents the temp at which you can expect 10% of the buds to be killed which is probably no big deal. 90% represents the temp at which 90% of the buds will be killed, which is a much bigger deal, but for a backyard grower can still mean getting a handful of fruit. Sorry, I did not see your question until now. @ztom has already respond to you. What I want to sis when you say “ killing off whatever is growing” , I hope you mean flower buds. 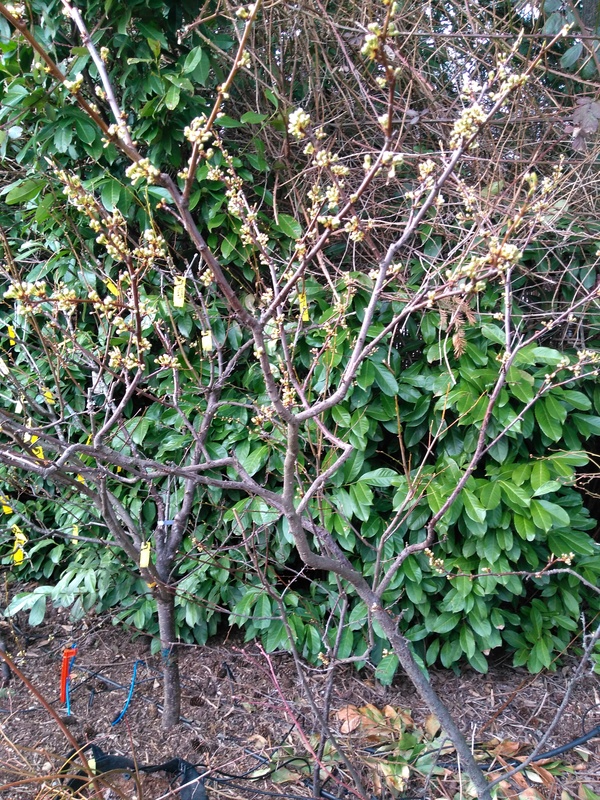 Leave buds are tougher and the trees themself can withstand a lot colder temp than their flower buds. Also, this chart is only general guidelines. Black Boy had a tinge of pink on the end of the buds. The rest of my peach trees have a lot of red on the end of the bud or are at a stage where the bloom is starting to break bud. 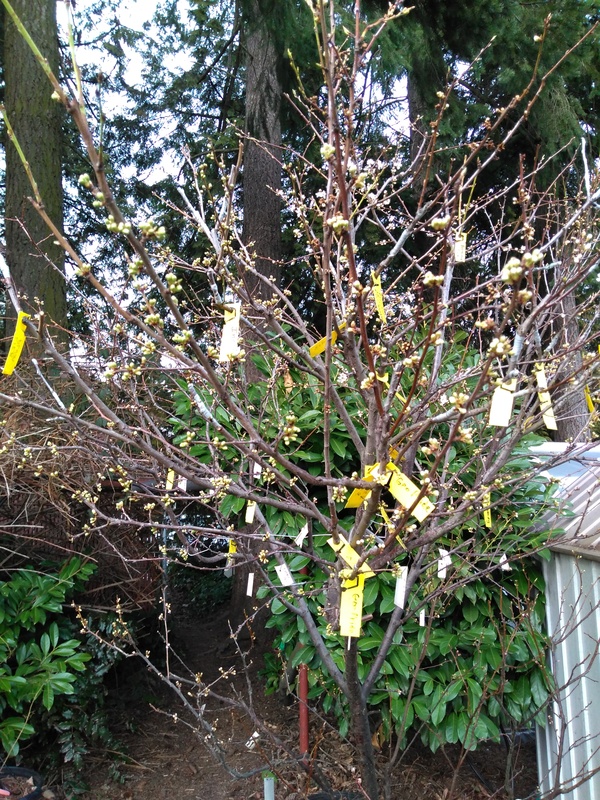 JuneGold, GoldPrince and BlushingStar are the surprise peach trees. JuneGold and GoldPrince are not noted for late blooms and Blushingstar bloomed early last year. Redskin is a disappointment - I did not realize it bloomed early. Looks like those ones not blooming are your high chill varieties? How are your apples doing? My four trees are close to showing some swollen buds/bit of green tip. Looking at temps back down in the mid-hi 20’s next week, so maybe that will slow them down? We had four days of temps in the 60s/70s, so I’m sure that didn’t help. I even have a few pear fruit bud swelling up. J plums are past full bloom. 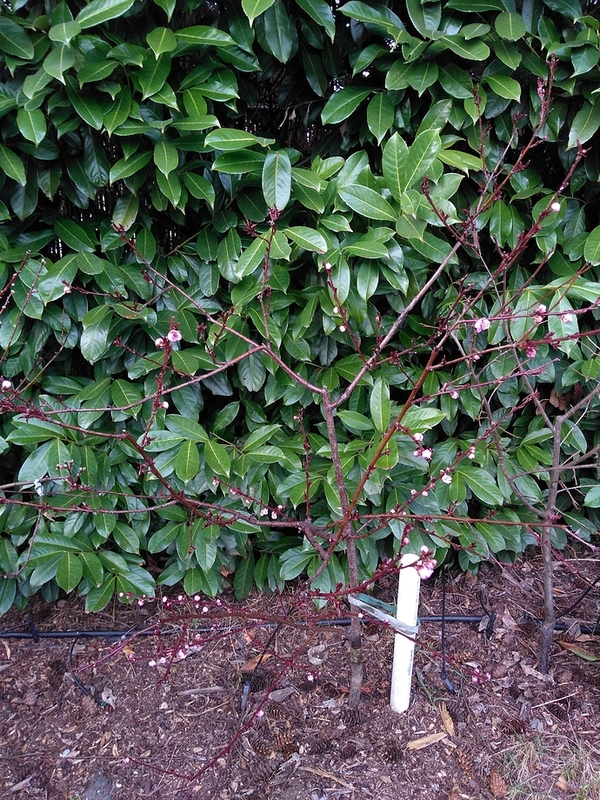 Now I can just tell which buds on pears and Romance cherries are opening to flower clusters. If my Ayers decides not to bloom even a few flowers this year, I’ll be upset. Last year no Moonglow blooms for the few Ayers and maybe this year the reverse, lol. They aren’t quite mature yet. The Bradford pears in the neighborhood were early, so I can’t think of any pollen around. Well, I thought they had been shipped, maybe not. No tracking #…so probably not. It depends what you call high chill - to me that means 900 plus hours. I don’t know the chill hours on all of the peaches but DixRed and SureCrop are both 900 plus chill hours and they are blooming. JuneGold and GoldPrince are both less than 700 chill hours and have no pink yet. The JuneGold is a small tree but the GoldPrince is a decent size tree. I have not looked at my apples closely yet but nothing is blooming. It still varies by duration of cold, daytime temps, etc, but I took the chart to mean that while freezes are a problem, generally they’re a bit hardier than people realize. Redskin is one of my earliest bloomers, but it has been one of the more productive peaches in frosty springs. It blooms over a long period of time. Also maybe the blooms are a little hardier. My avatar is a Redskin bloom. I’ve harvested Redskins for ten years. No matter what the weather, some production every year. It will be interesting to see how my peaches turn out this year. 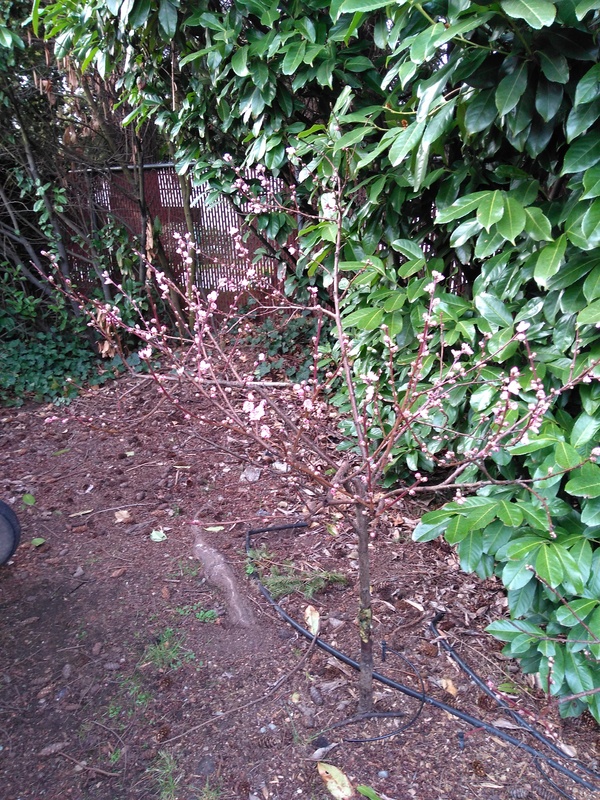 We hit 26F last night with my peach trees in different stages from bud swell to bloom. My Redskin is second year in the ground and it was a large tree when planted, it will be interesting to compare it to Belle Georgia and Dixie Red for fruit set. Temps are supposed to be 30 plus going forward. A lot of people talk about growing high chill peaches to get late blooms but from my observations this year chill hours is not always a good indicator of bloom time. I made sure most of the trees I planted this year were trees that had a reputation for being late bloomers and/or frost hardy. Many of the trees I planted previously have turned out not to be frost hardy - Belle of Georgia, Coral Star and Hale Haven being the most notables. It looks like Elegant lady and Crimson Rocket are not frost hardy either, but I will give them more time. I have got enough trees planted now that I should be able to figure out which ones are right for my area and frost hardy in a couple of years. Olpea, thanks for sharing the info on Redskin. Certainly looks cold out there. I bought a “TruGold” from Lowes last year. How did you determine your tree is not a genuine TruGold? I really hope i dont have to wait until it fruits to figure this one out. Also, how was the fruit quality on the impostor trugold?